Vendor look-back-in-time has on sale at eBay the bookplate of Richard Joseph Sulivan of Thames Ditton. The bookplate would appear to date from between 1778 when he married Mary Lodge and his receipt of a Baronetcy in 1804. Arms: Per fess the base per pale, in chief Or a dexter hand couped at the wrist holding a sword erect proper hilted Gules the blade entwined with a serpent proper between two lions rampant respectant of the second the dexter base Vert charged with a buck trippant Or on the sinister base per pale Argent and Sable a boar passant counter-changed. Crest: On a ducal coronet Or a robin holding in the beak a sprig of laurel proper. 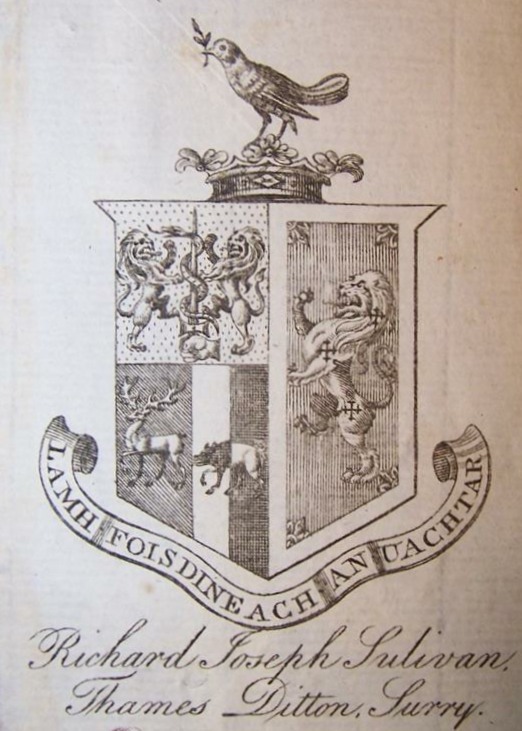 Motto: Lamh foisdineach an uachtar (What we gain by conquest we secure by clemency).